Jim Andrada and I got off topic in the audio section and it was so much fun that I opened a new thread to continue the conversation here. Okay, it's not exactly DV production, but practicing photography and learning film can definitely contribute to one's video shooting skills. If 2/3rds of good video is audio, how come there is only one Audio section? In summary, I got a Bronica S2A and am taking a darkroom class. Jim has an amazing background in photography and brought up the possibility of getting an old 1950s 4x5 press camera. Apparently, you can get a Graphic 4x5 for about $300. 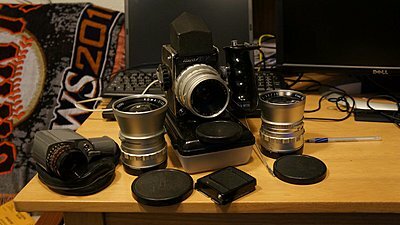 Getting a 4x5 camera could be attractive. Not only would it make a great prop, but it allows fast, easy contact prints. For those not versed in film, for a "contact print" you just develop the negative, then lay it on top of photo paper and expose. No enlarger required. Just squeeze the emulsion side of the negative to the paper with a sheet of glass and apply light. This allowed fast turnaround for the press, back in the day. 4x5 materials aren't too expensive. Using "4x" as the guideline, one can blow up the prints to 16x20 before the film grain gets bigger than the paper grain. I'm going to stick with the Bronica S2A and Nikkor 70/2.8 for now, but a 4x5 sounds really fun. It's really at the limit for "people on the street" photography. I never had a Bronica or Blad but I did have one of the first Mamiya RB67 cameras. Before that I had a Rollie TWL along with a couple of Nikon F's and I did have a 4x5. I used Deardorf 8x10 view cameras with 5x7 and 4x5 backs and had the absolute pleasure of using a Deardorf 11x14. WOW! My wedding camera was a Graflex XL 6x7 with an 80mm lens (stock) a 3 220 film backs. Rangefinder, quiet sharp as a tack. I loved the RB67-great image, great camera BUT it sounded like a canon going off. When the mirror snapped, it was BAM! The image was great. That was my go to for fashion and model comp shots. The Graflex XL was my wedding camera, the Nikons for news, sports and journalistic stuff and the view cameras were at a studio I contracted to for catalouge work. My personal view camera was for fun stuff. The images produced from the 6X7s and up were simply fantastic! Kodacolor, TriX, PanX, Extachrome and of course, Kodachrome. Gotta love the film days! This is my Kowa 6 - I was still trying to beat the system in those days. Kowa 6 was touted at the Japanese Hasseblad. All lens had their own leaf shutter. My pic below includes 85mm F 2.8 Kowa, 55mm % 3.5 Kowa, and 150 mm F 3.5 Kowa lenses, They gained a reputation for a faulty film advance but this one still working reasonably well. Thought about selling it once or twice, but never seemed to be that good in terms of return....See attached pic. I shot with my mentor's RB67 for a number of years... MAN, I miss that thing and you hit the nail right on the head... NOTHING subtle about the shutter/mirror release! I have two RB67's and absolutely love them - Don is absolutely right about what the mirror sounds like. It's a heck of a "Whomp" because the camera has a revolving back (Revolving Back = RB - Damned clever eh) and the format can be 6 x 7 cm either verticaly or horizontaly, so the mirror is a lot bigger than the mirror in a Bronica etc. In fact mirror slap can be limiting to the quality of the image at any slowish shutter speed so when used on a tripod I always use a special Mamiya cable that forks into a mirror tripper and a shutter tripper. Push part way down and the mirror does it's WHOMP thing and then wait for the tremors to subside and push further and the shutter clicks. Why do I have two camera bodies - because I found a great 500mm lens and it only works on the Pro - SD which has a larger lens opening than my Pro-S. So I bought a Pro-SD body for next to nothing just to hang on the back of the lens. I also got a macro extension tube and the 140mm macro lens. VERY sharp. Following is a shot of a poor unfortunate moth taken with the extension tube and macro lens shortly after passing into what the Japanese refer to as "eternal sleep". Chris, I forgot about the Kowa. I never had or used one but I knew a couple of guys that did and they loved them. I think at the time we were all looking for anything to get away from the 35mm cameras. Can't figure out why though. I loved my Nikons but for me each camera had a different purpose in life. Do you remember the camera that was in the shape of a 35 but shot 6x7? Pentax perhaps? I can only image how unwieldy that beast was. Thank goodness I never forgot that when using the Deardorfs, especially the 11x14. That film was pretty costly. Yeah - I forgot to add my +1 to Don's response - it is a nice setup. Mamiya 7II though (and a couple of Fuji's) are really superb handheld cams because they are rangefinder beasts - no slap. I think the lenses for the Mamiya 7 are among the sharpest in the universe.The Mamiya fetches quite high prices for a 120 camera.on the used market. I can remember owning a little old meterless Pentax 35mm SLR and lusting after the Pentax 6x7. Bigger was better in terms of image, in those days. Same old issues we discuss today, lens sharpness, depth of field, grain, low light performance.. Remember pushing Tri X and others to hi ASA ratings by using different times and developers. Chris, I remember back when pushing TriX as high as 2400. Nightime, news stuff. Strobe or not 2400 for newpaper stuff was "da bomb"!! ;-) No one cared about grain. Heck for some shots the more grain the better! Ah the "good old days"! Ha, if they were so good we'd still be using the Nikon F's, the RB67's and the Rolli TWL's. Still all great cameras! <sigh> Now I know I'm gettin' old! The RB67 has a louder shutter/mirror operation than the Bronica. Man, oh man! The Bronica is interesting in that the mirror slides down rather than flipping up. This allows the lenses to go deeper into the body so they apparently need less optical correction. Since the mirror faces up and the ground glass isn't blocked, there are curtains that slide over to cover the ground glass and mirror to keep stray light from entering and light from the lens from bouncing around. With all that stuff going on, as well as the focal plane shutter, everybody within earshot knows you released the shutter. That said, the vibration isn't too bad. Since the mirror slides, rather than flipping on a hinge, it's fairly stable. And since the camera is so heavy, I can easily shoot 1/30 handheld with the 75mm lens. At that point, one risks more subject movement than camera movement. I guess that 1/8 on a cheap tripod could be trouble. For bulb exposures it's no problem since the exposure time is much longer than the slap time. I recently heard somebody say that they learned as much shooting digital (video) for a year as they did shooting (cinema) film for ten years. With the high cost of film, you couldn't shoot much and when you did you didn't get instant feedback. Personally, I think DSLR video is an amazing training ground. It's cheap per shot, you get instant feedback, and you're forced to fit things within 8-bits while doing everything manually. Moving to medium format film after shooting DSLR video has been a blast! I'm using Sunny 16 related exposure rules when I can. For really challenging stuff, I break out the DSLR and get it right with the histogram and then freewheel for a while from there. The stuff I learned from the DSLR really improved my film shooting and the stuff I continue to learn with film stills helps me improve my artistry with the DSLR. The big difference though is that I want to enlarge and frame my best film shots. I've only rarely done that with the DSLR. There was something magical about the darkroom. When I lived in hills above Fresno in a mobile home on my in-laws small ranch in early 70's, I built my self a freestanding darkroom. I built a sink to using fiber glass to accomodate 11 x 14 trays, and installed own water heater. Knew nothing about carpentry, but learned fast building it from the ground up. Spent many late night hours in that dark room. Even experimented with color processing, using filters in my Bessler 23c... lusted after the dichroic color head, but never got one. I thank god for digital most of the time, but occasionally, that darkroom ritual comes back as a fond memory. Your right on - magic! First time I developed negs and prints I think I was 4 or 5 years old helping (???) my father. We didn't actually have a darkroom, just waited for it to get dark and set up on the kitchen table. I remember the first time I saw a print coming up in the developer. Wow! I was hooked. The smell of developer, the yellow fingers. Brings back so many memories. Oh to be that young and eager again. When I started developing my own color film and printing in color and developing Extachrome I was stunned and amazed. Good Golly Miss Molly! I was in sixth or seventh grade and my chemistry teacher asked me if I'd like to learn photo processing. And learn I did - from general principles all the way to specific technologies. And this was another time, another part of the world - we didn't just walk into the store and buy the prepackaged chemicals - we MADE them. Yes, from metol, hidroquinone, sodium carbonite and so on. No digital balances, just good old/ancient mechanical ones... How the world has changed! I will never forget those experiences. Any of you guys made your own chemicals?